The Labor Party in Tasmania was a late developer. The 'hated stain' of convictism, lowering worker morale, allowed some early trade unionism, such as the free tailors' strike in 1847 and the establishment of a Hobart Trades Council in 1883. Four MHAs, three from the mining west coast, in 1903 established a pledged Labor Party, which held its first conference at Hobart that June, attended by the federal leader, JC Watson. John Earle, a miner and blacksmith, became the Party's first parliamentary leader, with journalist WA Woods its first secretary. Woods was a founder member of the Australian Workers' Union, whose Tasmanian advent in 1907 assisted Labor. The establishment in 1909 of Hare-Clark proportional representation by conservatives hoping to neutralise the Labor party machine had the reverse effect. In the same year, anti-Labor division made Earle Premier for a few days. Immediately before the First World War, with federal Labor in government and a Wages Board system operating in the state, a minority Tasmanian Labor administration took office. Under Earle's premiership, 1914–16, the Labor Party, though dependent on a maverick independent and impeded by a relentless Legislative Council, gained administrative experience, established a Hydro-Electric Department (later Commission or HEC), and cushioned the decline of employment in west coast mining. With Tasmania supporting the 'Yes' vote, Labor split on the conscription referenda. Earle and several allies became bitter opponents of their original party. Tasmanian Labor remained in the doldrums with Earle's successor, schoolteacher Joseph Lyons, emphatically defeated in the state election of 1922, but he established a minority Labor administration in 1923 after the disintegration of the Nationalist government. Abandoning a brief flirtation with socialism, Lyons shed party platform radicalism in a celebrated speech at Deloraine. In the 1925 election he won the Tasmanian Party's first parliamentary majority and set a significant precedent. His government's low-key approach appeared to extract satisfactory finance from its federal counterpart. 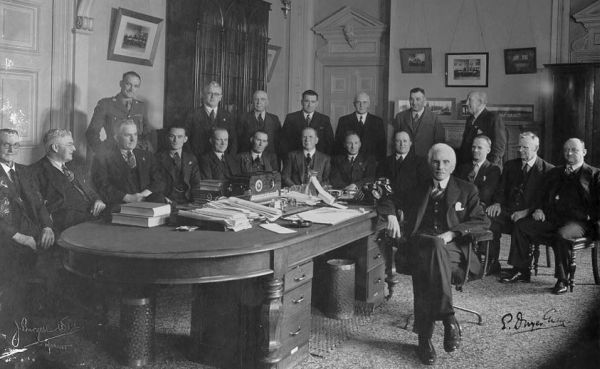 Persuading the Administrator to endorse a budget impeded by the Legislative Council, Lyons lost an opportunity when a compromise settlement retained the right of the Council to block supply. The government was weakened by the forced resignation, after a scandal, of Attorney-General Albert Ogilvie. Losing office in 1928, Lyons moved to federal politics, while Ogilvie led a state Labor Party dispirited by the Great Depression. An inglorious flirtation with Lang Labor and brief disaffiliation from federal Labor followed. Emphasising national credit in opposition to harsh economic orthodoxy, Ogilvie, dependent on a Social Credit MHA, obtained a majority of one in the 1934 election. Ogilvie's ruthless dynamism in creating public works and reversing financial cuts, often in the teeth of union opposition, led to a landslide victory in 1937. The 1934 victory inaugurated 35 years of unbroken Labor rule. On Ogilvie's sudden death in 1939, he was succeeded briefly by Edmund Dwyer-Gray, an Irish eccentric, before grocer Robert Cosgrove established a remarkable 19-year political dominance, broken only by a brief interregnum under Edward Brooker while Cosgrove successfully faced a corruption trial. Cosgrove's large majority dwindled in the 1950s when population growth and a 30-member House of Assembly made it difficult to obtain a majority. Cosgrove, however, deftly handled independents and increased Assembly seats to 35. A devout Catholic, he neutralised the effects of the 1954 Groupers' split in Tasmania (see Cold War). Despite the constant rumblings of left-wing unions, Cosgrove appeared impregnable when he relinquished office to Eric Reece in 1958. Reece forced the resignation of recalcitrant Treasurer Reginald Turnbull. Emphasising development and employment through hydro-industrialisation, Reece soon achieved a majority in the enlarged House of Assembly. A surprising defeat by a rejuvenated Liberal Party in 1969 ended his hegemony. Although Reece returned to power three years later, the example of the trendier Whitlam federal Labor government, the whiff of Green politics inside the Tasmanian Party and the ambitions of a new leadership generation preceded his resignation in 1975. Reece's replacement, Bill Neilson, confronted the débâcle of Whitlam's fall in late 1975 and the intra-Party struggle between the federal and state executives over the expulsion of the Tasmanian right-wing union power-broker and later senator, Brian Harradine. Reformed Party rules, removing bogus branches and establishing a more democratic state council in place of the old amorphous state conference, helped the 'Broad Left' faction to dominate the Party for the next decade. Neilson won an election in 1976 but soon retired in favour of the younger Doug Lowe whose emphatic state victory in 1979 led to an attempt at inter-party consensus. Lowe's effort to save the iconic Franklin River by an HEC dam higher up the Gordon River incurred the opposition of both left wing-unions and the conservative Legislative Council. Deprived of office, Lowe duly forced his successor, Harry Holgate, to a disastrous election. The Liberal administration of Robin Gray, 1982–9, denied the Franklin dam by the High Court, acknowledged Eric Reece's example in its developmental policies. In 1989 Gray fell to an 'Accord' between Labor under Michael Field and the Greens who had secured five Assembly seats. Field, adopting the market values of Hawke and Keating in Canberra, reduced the public spending of his predecessor, before the 'Accord' collapsed over forestry logging quotas. Field's cuts and the Green link led to a humiliating defeat in 1992, and his replacement by an economically dryer Liberal administration. Itself dependent on Green members, now rejected by Labor, the Liberal government in 1998 sought HEC privatisation. Rejecting this, Labor, under former unionist Jim Bacon, won convincingly in 1998 and 2002. Helped by more regular federal finance through the GST, but still challenged by a resurgent Green Party over issues such as the clear-felling of old-growth forests, the Tasmanian Labor party held a clear majority in 2004 when ill-health forced Bacon to relinquish the leadership to his deputy, Paul Lennon. Holding office for 61 of its 101 years, the Tasmanian Labor Party became one of the most successful Labor parties in Australia. Apart from brief interludes, it has eschewed ideology in favour of developmental pragmatism, typified by Joseph Lyons' 'Deloraining'. Often the Party's successful tenure of power has been balanced by the frustration of left-wing unionists and branch activists. Further reading: R Davis, Eighty years' Labor, Hobart, 1983; ' Tasmania', in A Parkin & J Warhurst (eds), Machine politics in the Australian Labor Party, Sydney, 1983; and ' Tasmania', in D Murphy (ed), Labor in politics, Brisbane, 1975.